All of Florence, including its churches, squares, and public buildings, is a museum. But there are some museums in Florence that you will not want to miss on your visit. Here is our list of the top museums in Florence. The Galleria degli Uffizi is one of the top attractions in all of Italy, as it is the world’s premier museum of Renaissance art. Works from all of the famous artists of the Renaissance are on display at the Uffizi including paintings and sculptures from Michelangelo, Leonardo da Vinci, Botticelli, Raphael, and Titian. Also on exhibit at the museum are altarpieces, illuminated manuscripts, and tapestries. Visitors are advised to reserve tickets to the Uffizi months ahead of their trip to ensure ticket availability and avoid long lines. 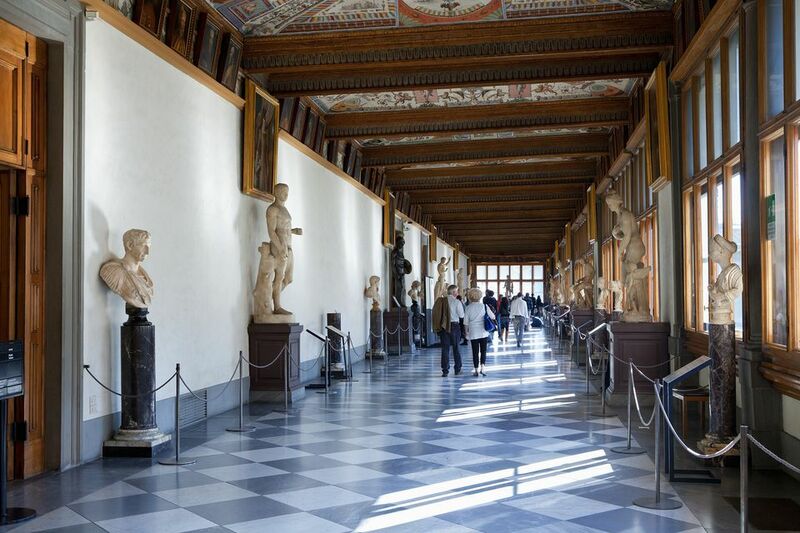 For a visit to the Uffizi without the crowds, consider a VIP Morning at the Uffizi and Vasari Corridor Tour that includes breakfast. Established in 1865, the Bargello was one of the first museums in Italy and is a premier sculpture gallery. The dozens of statues and busts on display at the Bargello were sculpted by some of the most famous Renaissance artists including Michelangelo, Donatello, Verrocchio, and Giambologna. Before it was a museum, the 13th-century building that now houses these priceless artworks was city hall and a prison before the ruling Medici family turned it into police headquarters (“Bargello”). The Accademia is most famous for its artworks by Michelangelo, in particular the large “David” sculpture, which was given a full restoration from 2002 to 2004. In addition to this statue, there are also unfinished sculptures of the “Four Prisoners” which Michelangelo designed for the tomb of Pope Julius II. Throughout the rest of the gallery are displays of art from the 13th-16th centuries, a collection of musical instruments, and pieces by other Renaissance artists, including Andrea del Sarto and Giambologna. The Museo dell’Opera del Duomo is the museum that holds many of the original works and blueprints from art and architecture related to Florence’s Duomo complex, which includes the cathedral of Santa Maria del Fiore, the Baptistery, and the Campanile. On display are some original statues and carvings from all three buildings, including Lorenzo Ghiberti’s panels for the Baptistery doors. You will also find exhibits of Duomo architect Brunelleschi’s plans and Renaissance-era tools used to build the Duomo. The Museum of San Marco Monastery features the work of Fra Angelico, an Early Renaissance painter and monk. Fra (or father) Angelico lived at San Marco, a monastery where he painted several of his best-known frescoes on walls and in its cells. San Marco was also the monastery where the firebrand monk Savonarola once lived, and the museum contains several of his personal effects as well as a famous portrait painted by fellow monk Fra Bartolomeo.